See highlights of BBC's EU Great Debate Jump to media player The EU referendum took centre stage at Wembley Arena as the two sides traded blows before an audience of 6,000 people for the BBC's Great Debate. 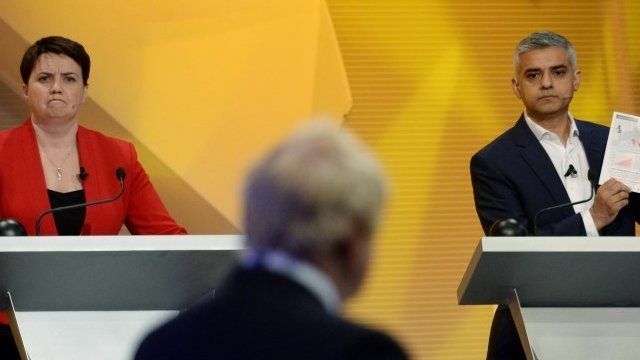 London mayors clash over immigration... Jump to media player Boris Johnson, former mayor, and Sadiq Khan, current mayor, faced one another in the BBC's EU referendum debate at Wembley Arena. Johnson calls for 'UK independence day' Jump to media player Boris Johnson and Ruth Davidson give closing statements summarising the arguments of the Vote Leave and Vote Remain campaigns at the end of the Great Debate. The EU referendum took centre stage at Wembley Arena as the two sides traded blows before an audience of 6,000 people for the BBC's Grand Debate. Both campaigns had three representatives each on their respective panels, including Scottish Conservative leader Ruth Davidson for Remain and former Tory London Mayor Boris Johnson for Leave.